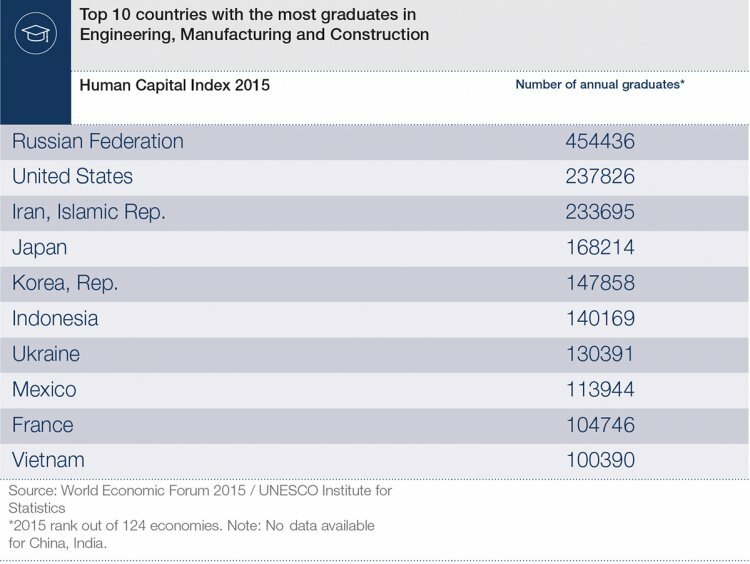 Which country has the most engineering graduates? A diverse and highly skilled pool of talent is a key driver of economic growth, allowing economies to make the most of their human capital. The World Economic Forum’s Human Capital Report 2015 provides data for 124 economies across a range of indicators, including the number of graduates in engineering, manufacturing and construction. The Russian Federation tops the list with nearly half a million graduates a year in the field. The United States follows in second, with Iran completing the top three. A minimum of 100,000 graduates are needed annually to make the top 10, highlighting the popularity of the field. The data for this ranking is taken from the UNESCO Institute for Statistics. Can a new university close the engineering gender gap?